Grade: Α — (Alpha) Great book, must read regardless of what Genres you enjoy. Makes you think of things beyond the scope of the book. 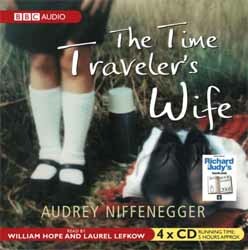 The Time Traveler’s Wife by Audrey Niffenegger is a wonderful piece of interstitial fiction about a man and a woman brought together and torn apart by time. Told in two perspectives, that of the time traveler and his wife, its dual first person narratives weave together a complicated story of a relationship shared across fractured times. I highly recommend this piece to fans of any genre, but note that one should set aside expectations of what the story will be about and the form it will take. This is a time travel story, with a temporal centroid focused on modern day (beginning of 21st Century)America, and a span that ranges about 40 years into the past and the future of a single person’s life. 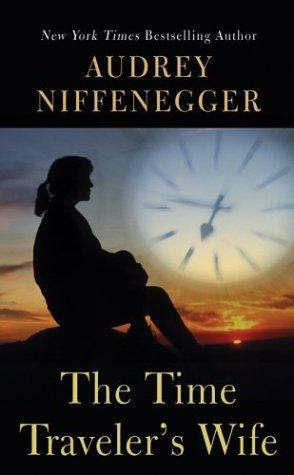 The Time Traveler’s Wife by Audrey Niffenegger successfully combines Science Fiction, Romance, and ‘Literary’ fiction into a fascinating tale that works on levels transcending its component genres. It is a character driven novel that follows the intricate and complicated love and relationship between a talented and beautiful but otherwise normal woman and a man with a genetic disorder that causes him to travel uncontrollably through time. In a complicated but easy to read set of dual narratives, we meet each character and explore their lives in what at first seems to be random orders through time. Soon, we realize the author has skillfully woven together the text in a manner than follows the dual time streams, focusing on that of Clare (the non-time travelling wife), and thus using her perspectives to anchor the shifting narrative of Henry (the time traveler). Indeed, I found the nature of her narrative, wordsmithing, and flow of language to as compelling as the story itself, though there were stylistic elements that occasionally grated. From a technical perspective, the mechanics of the time travel are not explored in any depth. Henry has a disease and cannot control where or when he will travel. He simply begins to feel a bit odd, then vanishes from one time frame and appears naked in another. He then stays an unspecified amount of time before being ripped out of time again to reappear in his ‘normal’ time frame. Henry does not understand his disease and cannot control it. It started when he was a little boy, and continued through his life, teaching him very quickly that in order to survive, he needed to steal, hide, lie and cheat. After all, people react badly when they find a naked person in their house, yard or wherever. It is on one of these timeslips that Henry first meets Clare, though Clare first meets Henry in a different time frame all together (if you see what I mean). That, in many ways, sums up the book as a whole. Throughout the tale, each gets to meet the other at different ages (though I don’t believe they ever meet when they were both children). Henry, in particular, sees Clare grow from childhood to adulthood, though in no particular order from his point-of-view. He also crosses his own time stream repeatedly, and from this comes to form (and occasionally abandon) a somewhat fatalistic view of personal choice. To that end, fans of Science Fiction will likely recognize this element of the time travel story, where one character sees the growth of another, as common to the genre. What The Time Traveler’s Wife has done, however, is really examine the personal nature of such a temporally displaced relationship, more fully exploring the implications of it. Doctor Who recently did (and probably continues to do) a very good story arc following this theme in the “River Song” plot line, but while as a whole that series predates this book, and indeed the author, it had never previously examined the personal implications of intersecting timelines with any sort of depth. Indeed, one cannot help but wonder is there was some inspiration coming from this book. R egardless, the intersecting time lines plot is a common motif within the genre, as is the second motif followed in the story: the fight or failure-to-fight destiny. To that end, The Time Traveler’s Wife is definitely a ‘causality play’, rather than a ‘temporal paradox,’ or ‘multiple futures tale.’ That is to say, it examines the nature of predestiny and one’s ability to change it. Discussing this topic in any greater detail would serve as a plot spoiler, however, since that is the axis around which the plot revolves. Interestingly, some reviewers less familiar with the nature of time travel stories fail to recognize this and complain about the occasional fatalism of the characters. Yet, despite my obvious enjoyment of the book, there are some weak points. 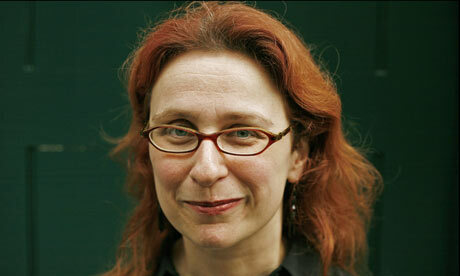 The characters, particularly Clare, are occasionally flat, and there are some scenes that go on a bit too long without serving their intended purpose to any great scene. For example, there is one scene describing a game of pool that I suspect is supposed to reflect the causality paradox by showing how hitting certain balls impact the position of other balls and results in a given result guaranteed by physics. Unfortunately, it drones on a bit too much and gets a touch tedious. Having said that, I still give this an Alpha rating; it did an extremely good job of weaving together the narrative and keeping me engaged with the characters even though the nature of some scenes create spoilers for later scenes. I suspect that if you go into this book expecting any particular type of time travel or romance story, you will be disappointed. If, however, you just let the tale flow and be what it is, you will also enjoy this tale. BBC Audiobooks did a wonderful job with this audio book. The quality of recording was very high, and the dual narrators, William Hope and Laurel Lefkow really added life to the tale. There are times, however, where I thought Hope’s attempts to make Henry a bit of a rascal were over done. This could be due to the somewhat dichotomous nature of Henry, for despite the fact the author tells us he is a bad boy, he never really comes across as one. Even so, Hope’s reading of the tough guy act got a bit too much at times. In contrast, Lefkow did a wonderful job of bringing Clare to life, adding depth that I think may not have shown as clearly in the text. Regardless of my minor complaints, I enjoyed this audiobook greatly and indeed, may have liked the book better for having heard it rather than listened to it. Thus the Science Fiction genre. Well, if you compare the original discussions of the TV series to the likely date of conception… she was born in June of 1963, while the show was aired in November of the same year, though original discussions predated that by over a year and so… am I pressing this metaphor too much? That’s what you get when a nerd starts thinking about time travel. This entry was posted in Identity, Science Fiction, Stand Alone Novel, Time Travel Story, Uncategorized and tagged audreyniffenegger, Clare, Clare GAA, Henry, Henry James, Science Fiction, The Time Traveler's Wife, The Time Traveler's Wife: Unabridged Edition, Time travel, Time Traveler's Wife, William Hope. Bookmark the permalink.